Senator TG Guingona has filed a bill pushing for an increase in the monthly salary of nurses nationwide to achieve a base pay of P25,000. Senator Teofisto "TG" Guingona III, Chair of the Senate Committee on Health and Demography, has filed a bill that seeks to raise the entry level compensation of registered nurses throughout the country to salary grade (SG) 15 for those working in government institutions. To those working in the private sector, an equivalent salary to SG 15 will be mandated. Senate Bill No. 2583 provides for a comprehensive nursing law that will repeal the existing Republic Act 9173 that was enacted in 2002. 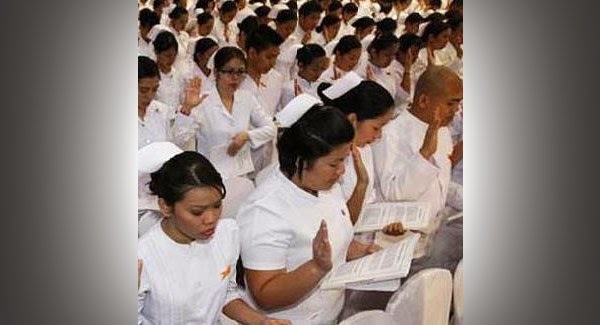 "To address the major challenges faced by Filipino nurses, this proposed bill seeks to institute measures towards relevant nursing practice, just and human conditions of work, and promotion of professional growth in accordance with the State policy to uphold the dignity of nurses and assume responsiblity for the protection, respect, and improvement of the nursing profession," Sen. Guingona explained. Sen. Guingona said that he proposed the measure due to the increasing number of unemployed nurses as a result of the health system's failure in determining and projecting human resource needs in and out of the country. "Plantilla positions in public hospitals remain unfilled, making nurses vulnerable to exploitation and unfair labor practices. In recent years, nurses have been forced to work in job order or contractual terms. Many accept "volunteer" work or pay "training fees" just to be able to work. We need to correct this," he said. Sen. Guingona further stressed that nurses are among those who play a critical role in achieving the intended goal of making health care services accessible to all Filipinos. Under the bill, it proposes for the creation and composition of Professional Regulatory Board of Nursing that will supervise and regulate the practice of the profession, including the proper conduct of the Philippine Nurse Licensure Exams (PNLE). The Board will be likewise mandated to issue, suspend, revoke or reissue certificates of registration for the practice of nursing and ensure the widest publication through electronic and written media. The bill also mandates all nurses to undertake continuing professional development (CPD). The Board shall provide a mechanism to continuously improve and enhance the nurses' competence by updating them on the latest scientific, technological, ethical and other applicable trends in the local and global practice of nursing. Likewise, the bill proposes that the Board, in coordination with the Department of Health (DOH), other concerned government and non-government institutions, association of hospitals and accredited professional organizations, to establish an incentive and benefit system in the form of free hospital care for nurses and their dependents, scholarship grants and other non-cash benefits. Based on Joint Resolution No. 4, Salary Grade 15 Step 1 is P24,887.